The Life Insurance Corporation of India is entering into 58th year of its glorious existence on 1st September 2013. 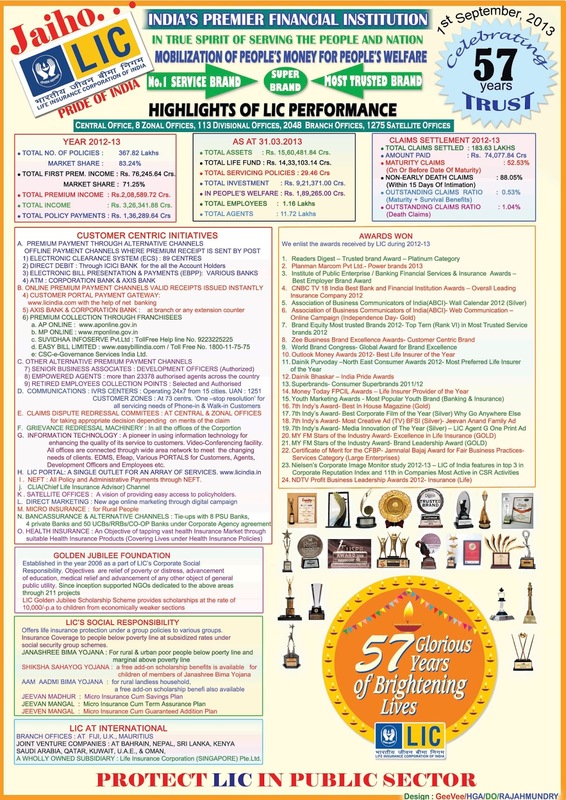 It has been a long and eventful journey of 57 years for LIC. Today LIC has grown from strength to strength to become one of the greatest financial Institutions of the country. It is now transforming itself into a gigantic Trans-National financial conglomerate. LIC is insuring the nation and ensuring smiles of people. Today, we are all proud to witness that LIC of India has completed 57 years of its glorious and purposeful existence in brightening the lives of millions. Moreover, it has played a pivotal role in mobilizing the savings of the people for nation building activities. Rightfully, LIC has emerged as 'Pride of India'. In spite of the sterling performance by LIC, the votaries of neo-liberal economic policies decided to open up the insurance sector to both indigenous and foreign capital in the year 1991. With the passage of IRDA bill, in the year 1999, the industry was opened up to private and foreign capital. The pundits of neo-liberalism were under illusion that once the insurance sector is opened up, the public sector LIC would crumble and collapse. In fact, one leading financial daily also wrote an editorial then that LIC is a white elephant and would not be able face the competition. Another newspaper carried a heading “A Black Hole in LIC”. There were attempts overt and covert to weaken LIC and paint it red. But, LIC has never looked back. It proved all its detractors wrong. Adapting to the needs of the changed market environment, the LIC faced the competition like a true champion. Today, even after more than one decade of competition, LIC remains the market leader and emerged as a market maker. This could be possible only because of the single minded dedication and team work of all sections of employees and field force. The committed workforce both in office and in the field is straining every nerve to nurture and strengthen the public sector LIC. Rs. 2,08,589.72 crores. The Life fund of LIC is at Rs.14,33,103.14 crores and its total assets are at Rs.15,60,481.84 crores. LIC has invested an amount of Rs. 9,21,371 crores in Government and Social sector. LIC has been one of the major contributors for the nation building activity of the government. In the first year of the 12th Five year Plan, LIC has invested Rs.1,83,988 crores. We may note with pride that for the 11th Five Year Plan, LIC has invested an amount of Rs.7,04,151 crores. LIC has settled last year around 1.70 crores maturity and survival benefit claims amounting to Rs 49,642 crores. It settled 7.26 lac death claims amounting to Rs 6390 crores. The out-standing maturity and death claims last year stood at a meagre 0.49% and 1.05% respectively. In fact, it is the best performance by LIC in last eleven years as far as settlement of death claims is concerned. This performance of claim settlement by LIC is par excellence and is unmatched in the insurance industry anywhere in the world. LIC is maintaining a solvency ratio of 154.15% as against the statutory requirement of 150%. It has a customer base of around 40 crores (both individual and group put together) and an agency force of around 11.73 lacs. We feel proud to be an integral part of the success story of this great financial behemoth. Further, we derive the satisfaction from the fact that our two decade long sustained campaign and struggles could protect and save the interests of LIC. 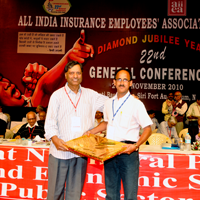 The LIC Act (Amendment ) Bill 2009, which aimed to weaken public sector LIC could be successfully thwarted only because of the massive campaign and struggle unleashed by insurance employees under the banner of AIIEA. The present economic situation of our country poses onerous challenges before LIC. The decline in domestic savings of our country is a matter of great concern to one and all. Escalating prices of essential commodities, petrol/diesel, Gas etc., are eroding the purchasing power of the common man. It is becoming very difficult for the common people to make both ends meet. It also is adversely impacting the savings of the people. Those who are in a position to save are getting inclined to park their monies in financial assets rather than financial savings because of the high rate inflation. Added to it, the difficulties encountered because of IRDA related matters. The LIC is deftly treading this difficult path and is trying its best to come out with flying colours. But it is matter of great irony that the government in order to overcome the present economic crises is further liberalizing the economy. Under tremendous pressure from both the international and domestic finance capital, the government is further opening up crucial sectors of the economy. As a part of it, the insurance sector is further sought to be opened up for Indian and foreign capital. This is an attempt aimed at providing more space to private capital to exploit the domestic savings of the people. The attempt of the government to pass the Insurance Laws (Amendment) Bill, 2008 in the present session of the Parliament is a pointer in this direction. The situation demands that the employees be ever vigilant. Our campaign both “at the Seat and in the Streets” must be intensified. Let us discharge our responsibilities in the office by giving our best to the customers and compliment it in the streets by aggressively propagating the commendable performance and marvellous achievements of LIC. Today, when LIC is entering its 58th year of purposeful and glorious existence, let every LICian take a pledge to protect and strengthen it on all fronts, aim for achieving its objectives and work for its eternal success and progress. We are confident that the insurance employees will envisage the challenges with proper understanding, engage themselves in campaign and struggle towards endeavouring the success of protecting public sector LIC.